It finally happened. I got the email that I was chosen to participate in the Plex Cloud Beta last week. I was excited to get going even though I have had some initial issues fundamentally thinking about the storage challenges with such a deployment. I’ve moved forward with my local installation which has been working great so now it’s time to give you my impressions after about a week of playing with Plex cloud hands on not just making speculations. So here goes, the good, the bad, and the ugly. This was very easy. 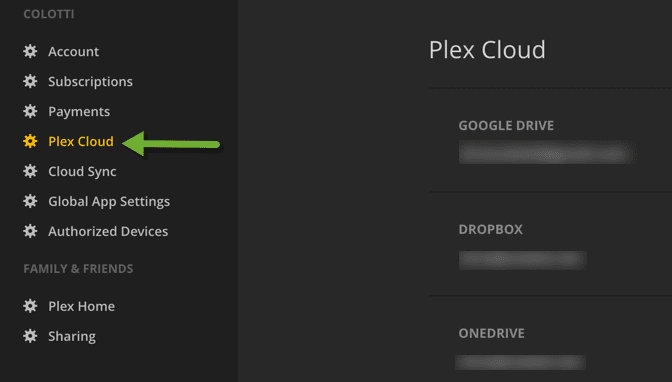 Once they enabled the access there was a new option in my server list for Plex Cloud. From there a few clicks to connect at least one of the three storage options and the Plex Cloud Server was spun up. From a “get up and running” aspect the deployment and initial setup was very easy. Since Plex does not have a library backup and restore feature you do have to start configuring libraries from scratch. Once you pick the initial storage provider it took me a bit to find where to add the others. It’s under your “Account Settings” from the upper right and is then on the left hand menu. Storage is the biggest issue of all with the deployment of Plex Cloud. I mentioned in a previous article the challenge with the storage is that with two vendors you are capped at 1TB each and all of them can add up from a price perspective. Each one connected fine but I am already seeing some issues with the Google Drive based files. On re-scan of the library things disappear then re-appear and some TV shows don’t get any meta data. Bear in mind for my testing I copied exact files from the local Plex Server so I would expect that any indexing and metadata the Plex Cloud version does should be the exact same. That does not seem to be the case. That’s your other storage challenge is copying the data from local to the cloud. It’s going to take other tools and will take a long time for large files. I’ve also experimented with pre-transcoding them down to make them smaller, but I cannot fully automate the transcoding, copying, etc yet. Once I did a little digging I also found out that the Plex Cloud instance goes into a standby state after a period of non use. You can in fact restart the server manually, but when you try to connect to it there is a long delay while it “wakes up”. Also I have found that after waking up the libraries are not there and you have to refresh the page. It’s a little annoying from a usability side of things for sure since you do notice the wake up time and then need to refresh to see the libraries. I think the shutdown and startup means they are using the Container version of Plex Media Server, and I’m also pretty sure it’s all running on Amazon Web Services. 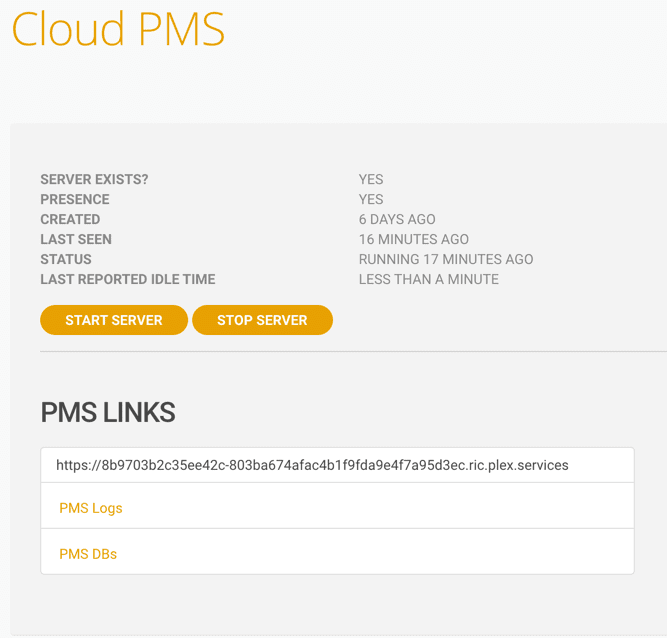 Below is an image from the basic management URL where you can see the uptime and basic controls. All in all it’s only been a week, and there is some wonky things about how the service runs, the limitations on the storage, and some other things I am on the fence about. Also I’ve yet to hear anything on some of this feedback I have submitted on the forums so frankly I am not sure who is even collecting the feedback from the Beta users. It’s very radio silent on the Plex Cloud Beta forum….so not sure what to think about that. I think it’s got a long way to go to get past the challenges and make it truly usable. I am not sure how to get over the storage hurdle and some of the other usability things I have seen unless they are currently working on them already. Has anyone else been invited to the Plex Cloud Beta? Do you have other feedback or things you have found so far testing it? You still have The plex cloud? Yes, people who had it still have it but they are not rolling out any more from what I read.